Water storage tank design isn’t the most glamorous work for an engineer, but it is extremely serious business. When tasked with this type of project, it’s easy to overlook some important steps and aspects of the design, especially when you find yourself pulled in different directions by business or government leaders with divergent ideas and priorities. 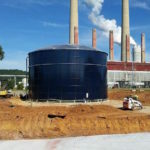 Here are eight simple tips to help you manage your next water storage tank design project. Budget can often be the biggest factor that determines the direction of any liquid storage tank project. Often, the first decision is whether to choose a reservoir system or a standpipe. There are a number of factors that determine a final price, but ground storage is typically the most cost-effective path to choose. However, the height of the tank can be impacted by factors like pressure requirements, the height of neighboring tanks and the space constraints of the property on which you are placing that tank, and there are times when standpipes are unavoidable. Be sure to research the versatility of ground storage tanks and pumping stations before resorting to an expensive elevated tank. With so many other things going on with the tank, it’s easy to ignore the importance of drains. A single inlet/outlet pipe might seem convenient, but it can lead to big trouble down the line. With older tanks or tanks without drainage pipes, the water goes in and out the same way. If the water in that tank goes bad, there is no way of getting it out without sending it back through the system. Ideally, you want a pipe that goes in, a pipe that goes out, and a third for drainage, even if that drain simply dumps on the ground. 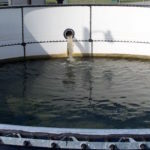 Water quality management is essential for EPA and local water treatment compliance, and you want to be mixing your tank 24/7/365. Any time you design a new tank, be sure to include a mixing system. It does not add much to the total cost of the tank if installed upfront, and it can make a world of difference in treatment costs. If your business or utility plans to grow within the next 20 years, you want to design a tank that has room to grow with you. Planning for tomorrow today ensures a smooth transition when needs change. Modular tank construction offers flexibility, allowing to expand your existing tank, rather than building a second later on. Adding on is always more cost-effective than building a second tank from scratch. Engineers like clean lines and symmetry. It just comes with the territory. However, dropping a tank in the middle of a plot of land can spell trouble later. Any time you install a tank on a piece of property, avoid the urge to put that tank in the dead center of the plot. Sure, it makes for aesthetically pleasing proportions, but what happens when you need to expand or add another tank? You have to scramble to purchase more property. Instead, install new tanks to the far left or right of the plot, so there is room to grow without buying additional land. Consider this: Anything coated with paint will have to be painted again. Painting and repainting a tank can be cost-effective in the moment, but you have to consider the long-term costs associated with continual rehab. 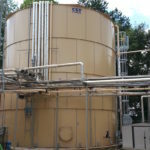 Elevated tanks and epoxy ground tanks can be the most difficult to maintain over time, adding to the total cost of that tank over the course of its life; while glass tanks are becoming more popular for their durability, versatility and low lifecycle cost. The design of the tank can impact the total cost in big ways. For example, keeping a tank under 40 feet tall typically provides the most value, especially if you can keep the tank close to a 1:1 diameter to height ratio. The taller you go, the more expensive the tank. Even if you have a great location, you’ve got plenty of space, and your budget is in line, the soil bearing capacity of a plot of land can rain on your parade if it’s less than 3,000 psf. When purchasing property for tanks, always conduct thorough sampling and testing to be sure that the land can handle the tank. If the soil does happen to be less than 3,000 psf, you can still build a tank, but know that the costs will likely be significantly higher. 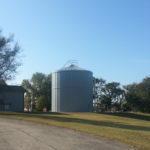 Water storage tank projects involve a lot of moving parts, and often, a lot of strong opinions from the people around you. 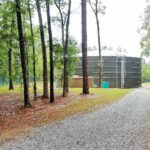 When you consider all of the elements of water storage tank design that impact the final cost, you’ll be better prepared to defend your choices and your budget to the powers that be.